Hungary missed five Olympics, but they have won the title nine times, which is a record. As of today, there are only seven tournaments in which Hungary participated but did not receive a medal. Hungary has taken part in every World Championships. They have won this championship three times: in 1973, 2003 and 2013. 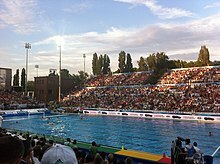 Hungary has taken part in the first edition of the FINA Water Polo World League in 2002. They have won the gold medal one and two years later. In 2006 and from 2008 to 2012, Hungary did not participate in the World League. The Hungarian national team missed three editions of the World Cup, but they won it fourth times: in 1979, 1995, 1999 and 2018. Hungary missed only one European Championship, in 1950, and they have won the tournament 12 times, which is (as in the World Championships) a record. No team has a better result than Hungary in history of the European Championship. Squad for the 2018 Men's European Water Polo Championship. Still active players are highlighted. Total number of matches played in official competitions only. ^ "Team Roster" (PDF). wp2018bcn.microplustiming.com. 16 July 2018. This page was last edited on 14 February 2019, at 18:43 (UTC).